(Scott Sommerdorf | The Salt Lake Tribune) Officer Josh Harris used to be a Draper officer until he got a job with Salt Lake City PD three years ago because SLCPD could pay more and had better opportunities. Photographed, Thursday, Feb. 1, 2018. Since 2009, 61 police officers have left the Layton Police Department. Of those, eight were fired, nine retired and 12 left to work for other police agencies. In addition, eight officers never completed training, and 24 have quit law enforcement altogether. Layton isn’t an outlier. Across the state, officers are leaving the profession “at a very quick rate,” Salt Lake City police Detective Greg Wilking said. 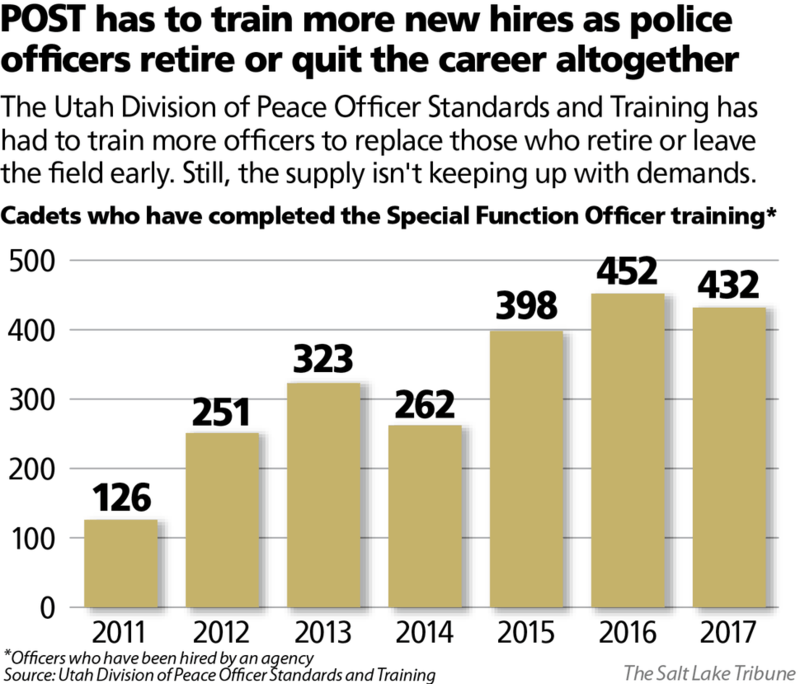 Maj. Scott Stephenson, who directs Peace Officer Standards and Training Council (POST) and the state’s police academy, informed the POST Council in December that the number of police officers was down by about 680 from July 1, 2017, when Utah employed 8,831 police officers. “We are hurting for people to have interest in our profession,” Stephenson told The Salt Lake Tribune. Agencies are struggling to recruit and retain officers partly because of diminished benefits to the state’s retirement system, as well as intensified nationwide scrutiny due to high-profile shootings of civilians by officers and concern for their own safety amid escalating hostility toward police. Departments also see fewer candidates when the economy is in better shape. Job seekers have more options in the private sector. Still, POST has seen its workload jump by 55 percent since 2009, according to Stephenson. For example, 432 hired cadets received Special Function Officer (SFO) training between July 2016 and July 2017. Between July 2010 and July 2011, just 126 officers took the SFO training. The Special Function Officer session is a prerequisite to two other training blocks, which have also seen an increase in enrollment. But the supply of newly trained officers is not keeping up with demand. And as police departments scramble to fill vacancies, bigger departments — which can offer higher salaries and more opportunities — are enticing experienced officers from smaller departments. Former Draper officer Josh Harris joined the Salt Lake City Police Department nearly three years ago. SLCPD could pay him better — $10,000 more a year — and offered more opportunities for promotion. But Eining added: “You can’t quantify the dollar amount that the experience that that six- or seven-year guy is taking with him. That’s a big loss. The officer deficit is also costly in terms of core training, said Stephenson, who noted that in the past three or four years, he has seen more younger officers quit the force. “That is huge,” Stephenson said. “You spend all this money training them and then, all of a sudden, there’s no return on investment. In addition to departments having to regularly hire replacements, fewer qualified candidates are applying. Of 254 potential police officers who recently applied to work for SLCPD, 94 showed up for the physical fitness test Jan. 28. And of those 94, many will be weeded out through an intense background check, as well as psychological, mental and written tests. The department is currently looking to fill 27 positions. That initial 254 applicants is nowhere near the number police departments got used to seeing in years past. That is causing agencies to compete with one another for a small pool of qualified applicants. The Ogden Police Department lost 28 officers to Salt Lake City in the past three years, according to Ogden Capt. Danielle Croyle. (Courtesy Salt Lake City Police Department) The Salt Lake City Police Department recently hired 40 new officers. Of those 40, 17 were hired away from other agencies. But the strain is harder on smaller departments as they struggle to incentivize officers and are left with the burden of training new officers and a less-experienced force. During the most recent hiring round, SLCPD accepted 36 applications from candidates who already work for other law enforcement agencies. Of those, 16 took the physical fitness test last month. Not all of the 16 who applied will be hired, Wilking said, but those who are will take less time and money to train. Meanwhile, the agencies the officers left will need to either hire other experienced officers or invest in new ones. Two years ago, when one of La Verkin’s police officers left for a bigger agency, it took nine months to fill the position. “I couldn’t hire anybody because everyone else was trying to hire at the same time, too,” Chief Lee said. The La Verkin Police Department is the smallest in Washington County, he said, and is stretched thin fielding calls. La Verkin’s police force consists of three full-time and seven part-time officers. It used to be four full-time officers, but the department wasn’t competitive, so Lee dissolved one position and used those funds to boost the pay of the other three officers. He is trying to hire someone now, but in the nearly four weeks that the position has been posted, Lee has heard from only three interested people. And none of them has the 12 months of patrol experience Lee is seeking. The corrections side of law enforcement also has struggled to attract enough qualified candidates. The Draper prison currently has 85 vacancies, according to Department of Corrections spokeswoman Maria Peterson. And Salt Lake County is trying to hire 100 positions to staff the jail: 70 positions to reopen the Oxbow jail, and 30 to replace deputies who have left, Salt Lake County Sheriff Rosie Rivera said. The jail often loses deputies because they want to be patrol officers, according to Rivera. “Trying to retain employees that we have is difficult,” Rivera said, because the environment is challenging and the pay isn’t as high as what a patrol officer would make. Police agencies have been getting creative in an effort to attract applicants. Salt Lake County has played promotional videos before films at three valley movie theaters to encourage people to apply for jail jobs. And the Unified Police Department recently announced that it will offer up to a 16 percent 401(k) contribution — 4 percent above the standard contribution offered under the state system — to the officers who were hired after the change to the state’s retirement plan as a way to try to bridge the gap. The Utah Highway Patrol — which is trying to land 100 officers — has posted “now hiring” billboards and videos online. And a year ago, UHP started offering education reimbursement and incentives to current employees who recruit new hires. Those efforts have helped, according to recruiting officer Sgt. Nick Bricker. UHP has received more than 1,000 applications, which is “definitely on the increase” from a year and a half ago, he said. 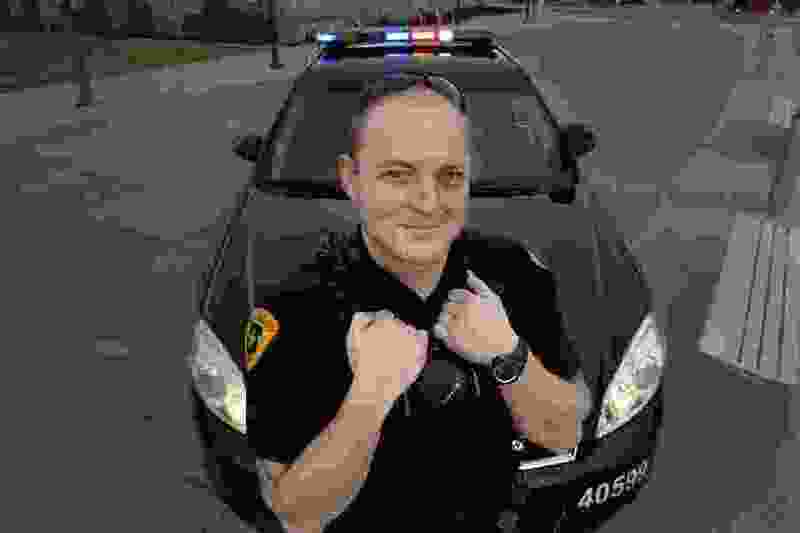 South Jordan is trying a program called RISE, in which the department pays for POST night classes for potential police officers. And a year ago, South Jordan loosened its policy on facial hair and tattoos. The old policy didn’t allow visible tattoos or beards. Now, tattoos are allowed, as long as they aren’t offensive or on the officer’s face or neck. And the men are now allowed to grow beards if they’re kept trimmed. South Jordan Police Chief Jeff Carr doesn’t think the updated policies will necessarily change someone’s mind about whether to be a police officer, but he said it’s at least a benefit for a profession that is struggling to recruit. Working against efforts to recruit officers is that in 2012 the Utah Legislature restructured the retirement plan for public employees, including law enforcement. Officers used to be able to retire after 20 years and get 50 percent of their top three years’ pay. Now, officers get 37.5 percent pay after 25 years of service. In the past year, the West Jordan Police Department has lost several officers to other states that offered better retirement plans, Holt said. SLCPD also recently lost two officers to out-of-state agencies, Wilking said. Since 2009 in Park City, five officers have transferred to other agencies in the state, six have retired and 11 have quit law enforcement altogether. In addition to the change in retirement benefits, police salaries often don’t compete with the private sector, which Wilking said ultimately contributes to distrust the public may have for police officers.